the leading French mural painter of thelater 19th century. He was largely independent of the major artistic currents of his time and was much admired by a diverse group of artists and critics, including Georges Seurat, Paul Gauguin, Charles Baudelaire, and Th�ophile Gautier. 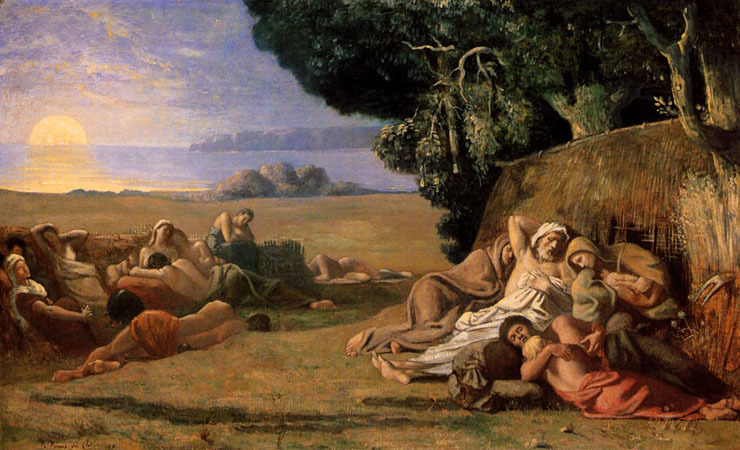 Puvis's teachers included Thomas Couture and Eug�ne Delacroix. 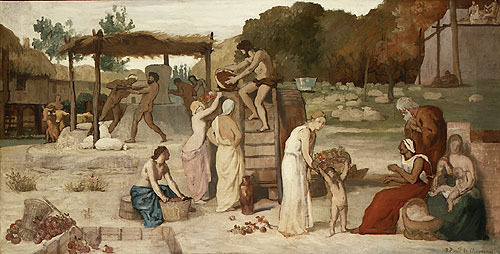 Although he exhibited regularly at the Paris Salons from the 1860s on, Puvis is best remembered for the huge canvases he painted for the walls of city halls and otherpublic buildings throughout France. 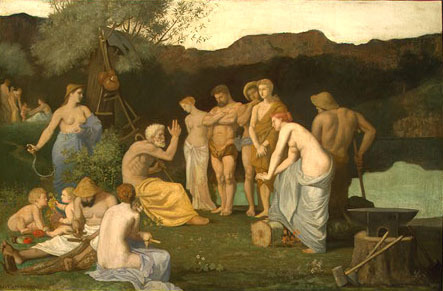 He developed a style characterized by simplified forms, rhythmic line, and pale, flat, frescolike colouring for allegorical pieces and idealizations of themes from antiquity. In 1861 he began an important series of paintings that became part of the decorative scheme (completed 1882) for the museum at Amiens. Among his other major commissions is a series of panels in the Panth�on, Paris, illustrating the life of St. Genevi�ve. 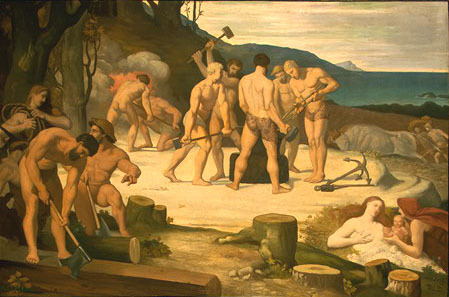 Begun in 1876, the work was completed by his students after his death. Other important Paris murals are inthe Sorbonne (1887�89) and the H�tel de Ville (completed in 1893). He also painted the staircase of the public library at Boston (1894�98). He is known primarily for his large decorative schemes depicting figures in landscape. Although he is generally regarded as a precursor of SYMBOLISM, he was independent of any contemporary movement, and his works appealed to academic and avant-garde artists alike. 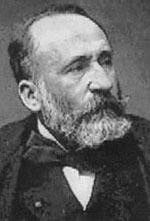 b Lyon, 14 Dec 1824; d Paris, 24 Oct 1898. French painter and draughtsman. 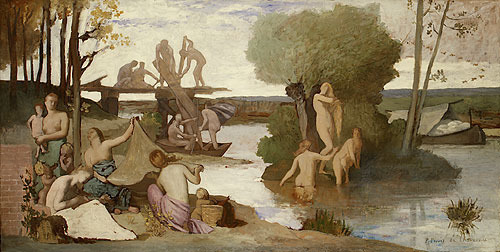 He is known primarily for his large decorative schemes depicting figures in landscape. Although he is generally regarded as a precursor of SYMBOLISM, he was independent of any contemporary movement, and his works appealed to academic and avant-garde artists alike. 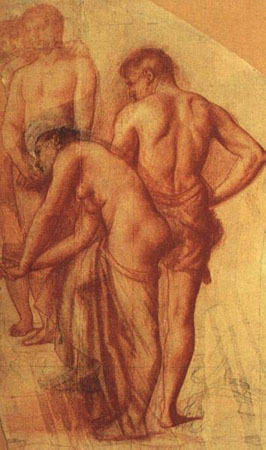 Study of Four Figures for Repose. 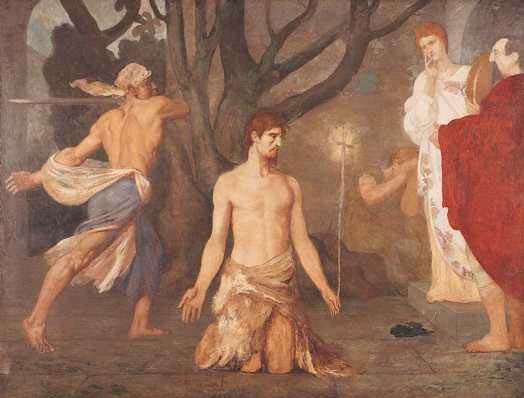 The Beheading of Saint John the Baptist.